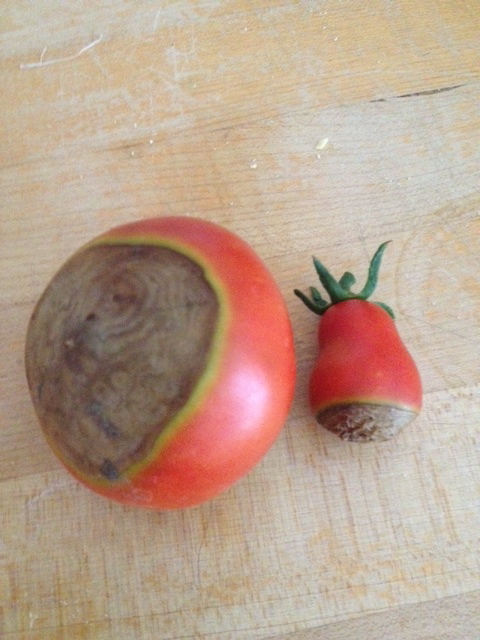 My friend Alison, who gardens in Bountiful, Utah, sent me a picture of her tomatoes that have blossom end rot. I think that the first one - fluctuation in soil moisture - is the likely cause of blossom end rot this season. It has been very hot, windy and dry. These weather conditions make it difficult to keep moisture in the soil. The Solution: Now that plants are bigger and are fruiting, they need to be watered more deeply. A drip system or soaker hose can get water down to the root zone - 12 or 18 inches under the surface! If you are hand watering, then you can dig a shallow trench around the base of each plant (not right next to the main stem, but out a few inches) and fill it with water 3 - 5 times to make sure the water is soaking in near the plants and not just sprinkling the surface or running off. Or try some plant nannies. *Caution: When your tomatoes start to ripen, watch for splitting. Splitting happens when they get too much water. Keep watering deeply, but not as often.